What does it mean to be Creatively Driven and Data Inspired? And perhaps more important, how does this combination come into play at the Cannes Lions Festival of Creativity? The 2017 Cannes Portrait series answers these questions by recognizing individuals who are using data and technology to make unique contributions to art, business and, of course, creativity. 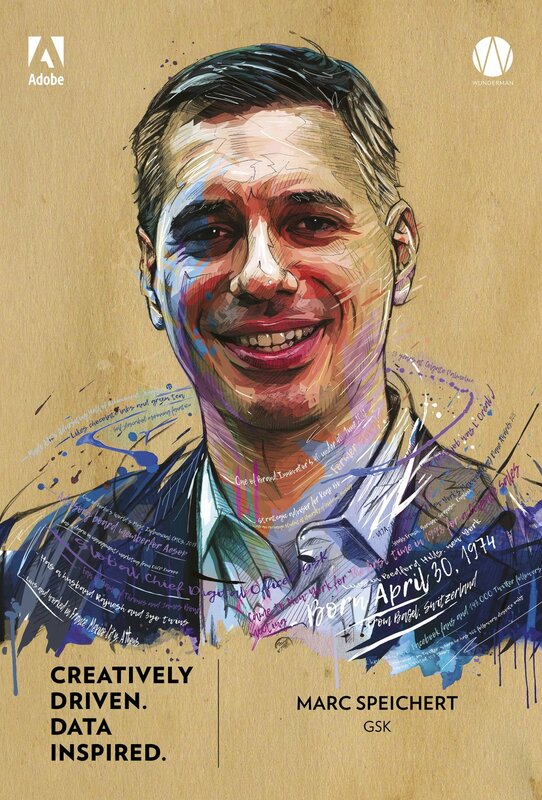 This year, Adobe and Wunderman have selected 11 true innovators—some fresh on the scene; others with long and storied careers. Whether they are coders, musicians, marketers or filmmakers, they are all finding new ways to connect creativity with data and technology so they can delight us, influence us and inspire us to take action. To celebrate their achievements, we also selected 11 artists—all chosen for their affinity with their subjects—to create portraits, using data as both a tool and for inspiration. You can find the results here and in real life on the Croisette starting June 17. We invite you to learn more about what makes our subjects so special in the gallery below. Born in Haiti, Wyclef needs almost no introduction, but the recording artist and songwriter first came on the scene as a member of The Fugees, the uber-influential hip-hop group. Since then, he has won three Grammys and written and performed on #1 songs in more than 20 countries. In addition to music, his charitable efforts, particularly around the Haitian earthquake and (most recently) prison reform, have won him much recognition, including the 2009 BET Humanitarian Award. Marc’s unique resumé blends a combination of data, creativity and broad industry expertise like few others. Formidable in operational and innovation roles, he has served as CMO for L’Oréal and as Global Client Partner at Google. Today he is Global Chief Digital Officer at GSK where he is bringing all of his combined experience together as a true digital champion for the global pharmaceutical powerhouse. As the Cannes Lions 2017 Marketer of the Year, Fernando has a long and storied career in advertising, including leading “Dove Real Beauty Sketches,” the most viewed campaign in advertising history. His first effort for Burger King, Proud Whopper, honored Pride Week and won 13 Lions last year. And no one should be surprised to see him make another Whopper-sized impression at the Cannes podium again this year. Thalia once served as the only female executive creative director at VICE Media, where she led the inception, development and execution of the award-winning joint venture with Intel, The Creators Project. Today she is the founder and force behind The Front, an all-female production and media company. With the tagline “By women, for the world,” the company is more than a content creator. The Front is a platform dedicated to supporting feminism and bringing a female voice to documentary film and entertainment. Ashley mingles art with neuroscience to create experiences that educate people and brands about the important social issues of our times. Notably, she served as lead artist on the VR film "Neurospeculative Afrofeminism," which was the Official Selection at the 2017 Sundance Film Festival. And for such an accomplished visual artist, you might be even more impressed to learn that she also has a master’s degree in cell and molecular biology. Ana was a Gold Award winner in last year’s Young Lions Marketers competition. Her winning idea (developed with Nino Ungiadze) enabled millennials to support a sustainable cause simply by opening a savings account. Their bank would then reward them by matching the account’s interest with a donation to the charity of their choice. Ana lives and works in Tbilisi, Georgia. Elisha (pronounced I-leesha) is a featured participant in this year's 2017 Young Lions competition. Currently at Dell, her accomplishments include graduating in the top 1% of her college class and copywriting for brands such as Oreo, Nivea, Olay, Pampers and Oral B. We look forward to a many more successes from Elisha in the future. One of the first women to win the AT&T Hackathon (LA), Cooper started her professional life as an actress but learned to code and left Hollywood for a career in technology. Today she is Founder and CEO of Klickly, a data-driven digital payments platform that has already made a big impression, winning both customers and awards, including the prestigious Consumer Technology Association’s 2016 Startup of the Year award. Named one of the 10 most influential CMOs by Forbes Magazine, Kristin has gained recognition for taking bold steps, such as requiring that their media appear on "human-verified" sites. She is known for believing in marketing that is both science and heart and as a champion for innovative work, including partnering with the Golden State Warriors (and Steph Curry) and making the Chase Sapphire Reserve card a must-have for younger travelers. Zaid is that rare person who thrives in the hectic and challenging world of startups and large corporations alike. A data-savvy marketer, Zaid spent the initial part of his career with P&G, where he won Cannes Advertiser of the Year. Then he served as CMO for HouseTrip, which was acquired by Trip Advisor, before he finally joined the BT Group. Above all, Zaid prefers big insight to big data, but you may not want to argue with him about the topic. Among many other things, he is a world champion debater. An entrepreneur since the age of 14, Timothy sold his first company when he was only 17. Now at 22, he leads Fanbytes, a video advertising platform that helps companies engage with audiences by enabling the creation and sharing of videos on Snapchat. Asked about what it takes to be so successful and committed to his career at such a young age, he admits that his relentless focus is a trade off, but he wouldn’t have it any other way. Of course, you deserve a portrait too. 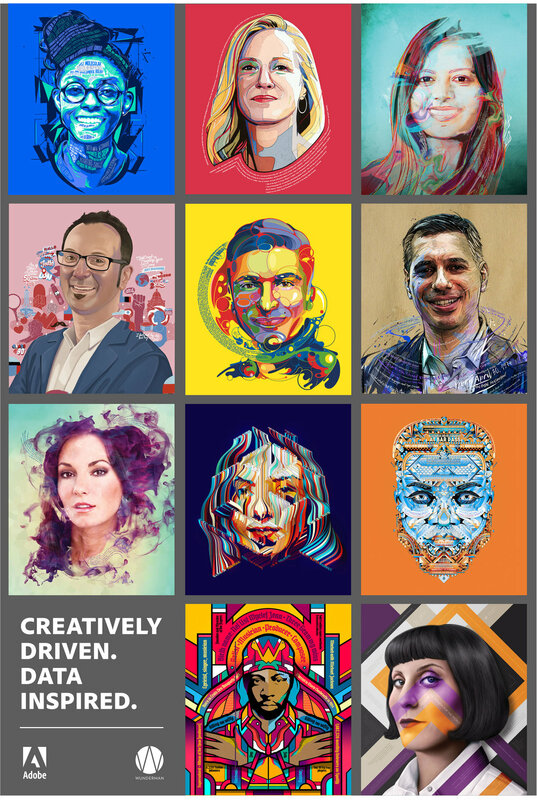 Tweet a selfie with the hashtag #cannesportrait, and we’ll send you your very own custom data-inspired portrait. Be creative too. Our favorite portraits will be featured in our digital Cannes Portrait gallery.